Three hundred thousand people contract MRSA and other hospital acquired infections every year. Some 5,000 will die as a result. Hospital hygiene has become such an issue that hospital cleanliness and hygiene recently loomed large in the general election campaign. Only this month, the Health Care Commission announced a hit squad of inspection teams which would turn up unannounced to inspect standards of hygiene and cleanliness in Britain's hospitals. So, across the country, urged on by the government, hospitals are pulling out all the stops to rid their wards of these potentially lethal infections. If you have been affected by any of the issues in tonight's programme and would like to talk to someone in confidence please call the BBC Action Line on 0800 093 4999. Lines are open seven days a week, from 7:30am until Midnight. All calls are free and confidential. Panorama has gone undercover in one of the country's biggest 3-star hospitals to see what's happening on the front line of hospital hygiene. And the results are frightening. 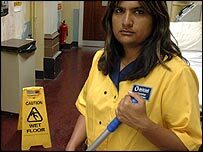 We meet cleaners who are great at making things look clean - without actually cleaning them as they should; cleaners who routinely break basic rules designed to stop infections spreading; and some medical staff who ignore isolation room procedures and risk spreading serious infection around their hospital. The hospital's own cleaning instructor says: "It's no wonder we've got infection going round like wildfire." At the same time, inspection procedures fail dismally, because they only look at whether things appear clean, not whether they have been cleaned properly. Controlling infection in hospitals is a complicated business, based partly on strict rules and procedures for cleaning. Panorama looks not just at how these procedures can be routinely broken, but at the difficulties hospitals - and sometimes the cleaners themselves - face in making sure that they are complied with. How clean is your hospital? Are you in 'safe hands'? What has Labour done for the NHS?